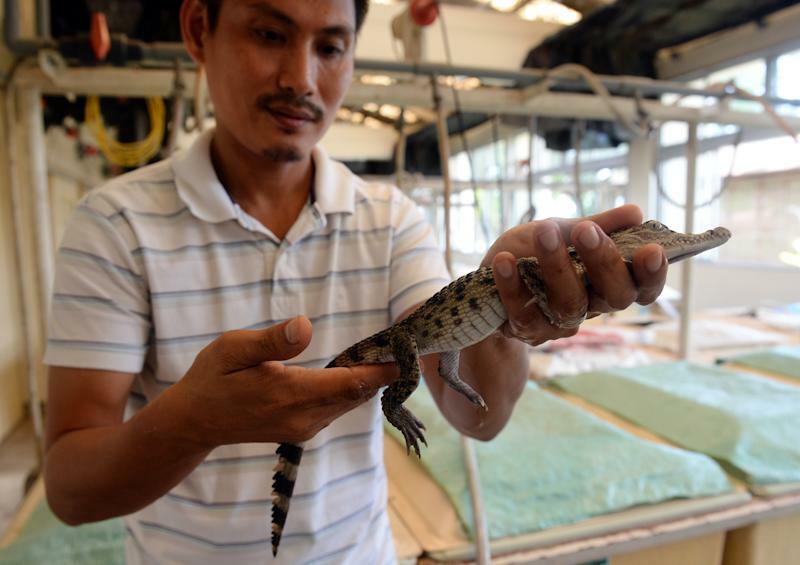 Puerto Princesa (Philippines) (AFP) - A chorus of chirps filled the room as one of the Philippines' top crocodile breeders checked on his wards in an overcrowded 'Noah's Ark' for one of the world's most endangered animals. 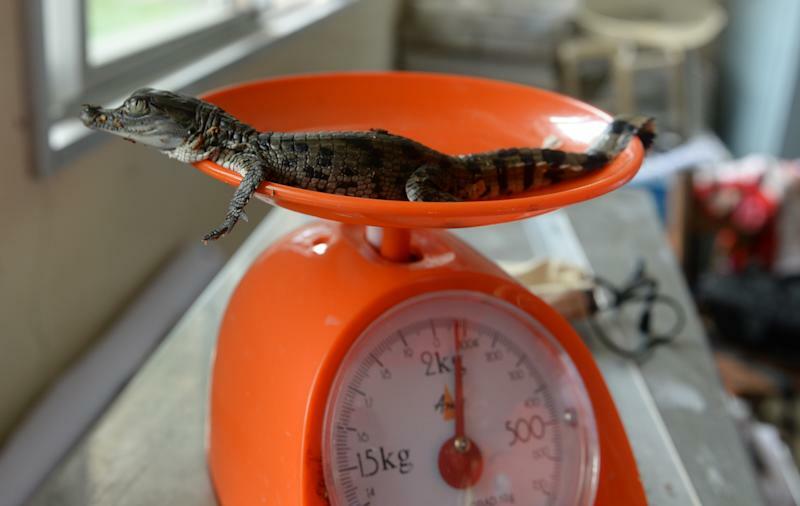 The chick-like cries came from metal tanks holding the baby Philippine crocodiles, artificially hatched by incubators from eggs that Glenn Rebong and his team had poached from their mothers' nests. "We're producing so many but there are few opportunities to release them in the wild. So they get stuck here and you get overcrowding," Rebong told AFP at the two-hectare (five-acre) Palawan Wildlife Rescue and Conservation Centre. Crocodylus mindorensis once lived in large numbers in freshwater lakes and rivers across the Southeast Asian archipelago, and are endemic to the Philippines, but were decimated by illegal hunting for the fashion industry. Fearful humans mistaking the timid creatures for their man-eating saltwater cousins and killing them, as well as a loss of habitat, have also contributed to their demise. By the time the Philippine government launched its captive breeding programme in 1987, a survey found only about 250 were estimated to be in the wild. Today there are likely fewer than that, as the areas they have been seen in recent years have got steadily smaller, according to Rebong. The International Union of Conservation and Nature lists them as "critically endangered", which is one step away from extinct in the wild. 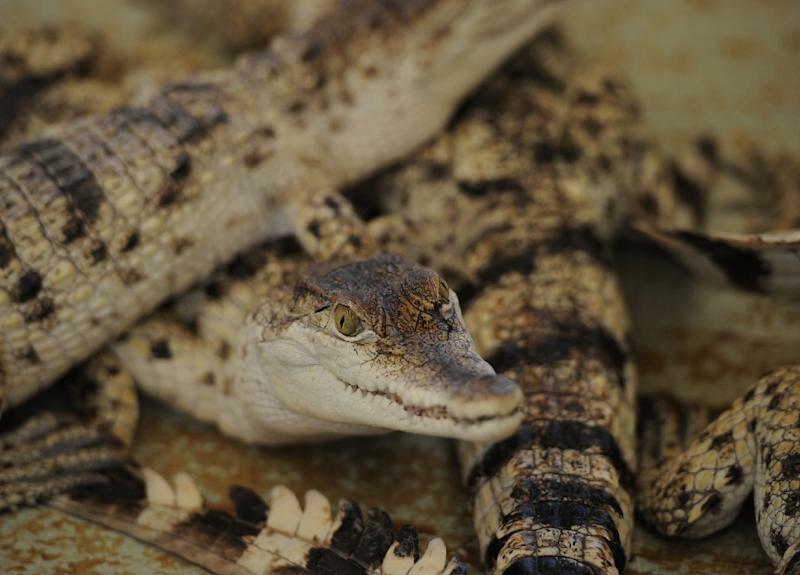 The largest collection of the species now live at the centre, while two smaller private breeding operations elsewhere in the Philippines and some small sanctuaries in the wild are also key to the crocodiles' survival. Built with Japanese development aid, the now financially struggling centre in the southwestern city of Puerto Princesa is home to about 500 crocodiles, about half of them freshwater and the rest "salties". The centre augments a meagre government budget by putting some of the baby and adult crocs on display for tourists, who are warned not to stick their hands or feet into the enclosures. The annual revenue of 12 million pesos ($274,000) from the tourists' entrance fees is just enough to pay for the fish that the reptiles are fed, as well as to cover the salaries of 45 staff. Selling some of the saltwater crocodiles for their leather provides another source of revenue. However it is illegal to sell the freshwater crocodiles, because of their critically endangered status, and the centre offers sanctuary for them. The breeding adults are kept inside grassy pens segmented by low concrete walls, where females build mounds of mud and weed for nests. The staff periodically raids the nests to transfer the eggs to the incubators, increasing their chances of hatching and ensuring an "insurance population" of at least 100 adults is maintained, Rebong said. The species was hunted close to extinction even though the rougher skin on its flanks is inferior to those of Crocodylus porosus, the larger saltwater crocodiles that are a mainstay of the fashion industry. Growing to not more than three metres, (10 feet) the freshwater crocodiles are shy animals that eat smaller prey than their bigger cousins. Unlike large crocodiles that defend territory, they tend to slink away from humans and Rebong said there was no record of any member of the species ever killing a person. However few Filipinos make the distinction between the aggressive salties and the freshwater crocodiles, wanting to kill either if seen. This has been a big factor in so few having been released into the wild, as has been their relentlessly diminishing natural habitats. Freshwater swamps that are their favoured homes are rapidly being converted into farms, housing, or ponds for commercial fish culture. In the nature parks where they have been released, the government has had to run education and incentive programmes to try and ensure they are not hunted down out of fear or for their lucrative skins. "You can't simply release them anywhere. We have to make sure they are secure in a particular area, otherwise they could end up getting killed," Rebong said. "People moving into a crocodile habitat kill them mostly out of fear. To them, a crocodile is a crocodile." In the biggest and most successful release, 50 freshwater crocodiles were let go over the past decade in the Northern Sierra Madre National Park, a sprawling 1,000-hectare spread of tropical rainforest in the north of the main island of Luzon. Communities in the Northern Sierra Madre went along with the scheme in exchange for jobs and skills training, said park superintendent William Savella. "They asked for incentives," Savella told AFP, and 10 locals were eventually hired as forest rangers, helping the government protect their habitat as well as monitoring the crocodiles' progress. Another 25 were set free last year at a nature park on the southern island of Siargao, but Rebong said there were no plans to release more into the wild anytime soon because of the habitat restrictions. "The ultimate measure of success is, they will breed and become a viable adult population (but) even if you breed a million here, they are still considered endangered if you cannot find any in the wild," he said.